Despite the fact that mathematics made Android phones possible in the first place, HTC’s built-in calculator is anything but advanced. Fortunately, there are apps like Scientific Calculator that replace your boring standard calculator with one that is more professional. In addition, the app includes e and Pi as individual keys for quick reference. The screen can fit up to 12 numbers plus five decimal places. By long-tapping the entry field, you can view or delete the history of all your previous calculations. The controls are really efficient. All the functions are listed in a scrollable window. The most important ones are located at the top of the screen. The functions are located at the bottom and the number pad is located on top. You can switch between these two screens by pressing the double arrow button underneath the entry field. The background color is black and the individual buttons are colored according to their function. The design isn’t very creative, but it fulfills its purpose wonderfully. 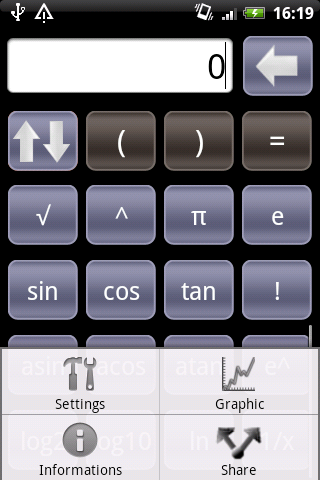 Scientific Calculator is a perfect tool for everyday use. The most important features are all there and are easy to use. I would, however, recommend using more advanced calculators for serious school or college work. During the test there weren’t any crashes or problems with speed. Scientific Calculator opens instantly and everything is lightning fast. 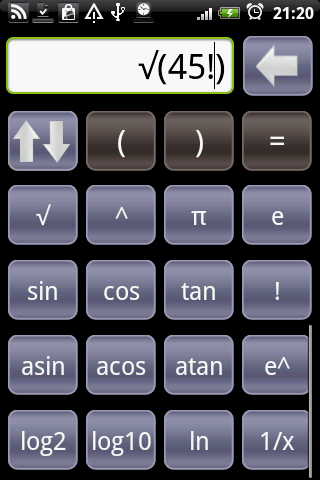 Scientific Calculator is available for free without any ads on the Android Market. realcalc is a good app too.